“After many years of amazing service, I have decided to sell my Roland MKS-80 Synthesizer with my MPG-80 controller. 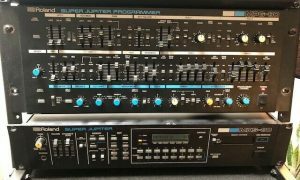 The synthesizer was recently serviced in Brooklyn, NY in order to fix a few voices that were louder than others and the synth was also re-calibrated and controller was cleaned once over. I use this most of my studio sessions and will continue to use it up until the moment it is sold. It has been the cornerstone of my studio for years but I need some extra cash to bump down my credit cards. It also comes with two cartridges for storing your own presets and changes.